Geographic detail. Striking colors will invite students to explore our most popular globes. 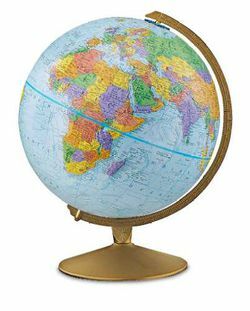 The 12" diameter, raised-relief, blue ocean globe offers a vibrant contrast to a metal gold colored base. One of our favorite first globes. Easy to read and with a sturdy metal meridian. Item Number Language Price Qty.